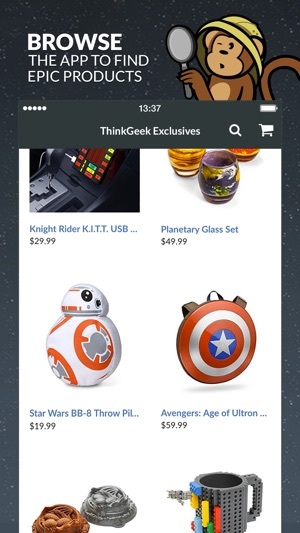 With the ThinkGeek mobile app, you have the premier retailer for the global geek community in your pocket. 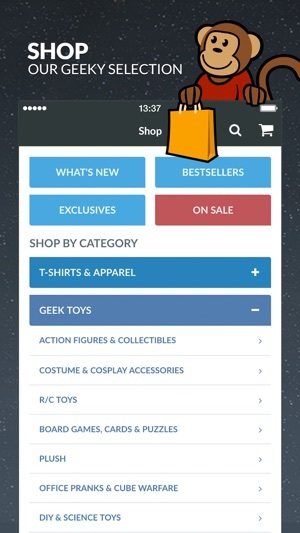 Shop our curated collection of goods, check out what's trending in the geek world, and be entertained by like-minded people. It's basically like using our mobile site, only cranked up to 11 or over 9000, depending on your fandom. Timmy hopes you dig it. Discover - Check out our latest promotions and timely content, including new products. This is your starting point. Shop - Browse the product selection however you like - check out our exclusives, explore by category, and save some money by shopping what's on sale. 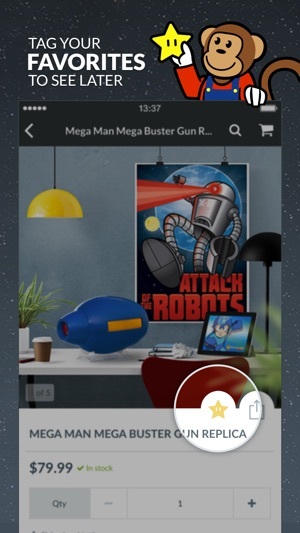 Favorites - Tag cool products you want to find again quickly. That high-end figurine for when you get your bonus. A t-shirt for when a friend's birthday rolls around. Something epic you don't want to forget. 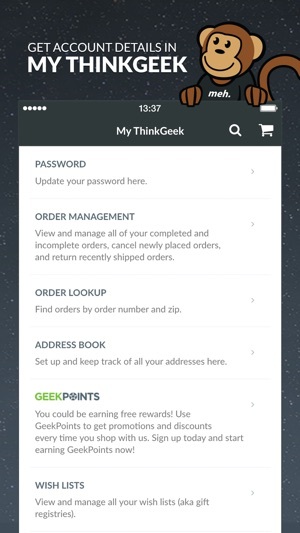 My ThinkGeek - Look up orders you've placed on the app or ThinkGeek.com, change your password, request a return, and all that kinda stuff. 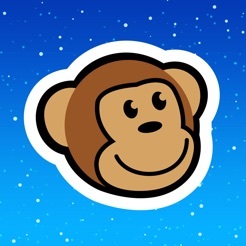 More - Get help, find store locations, provide us feedback on the app, and, well, more. - Behind-the-scenes platform and performance updates. - Fixed a bug on Store Locations that was preventing users from interacting with the search auto-complete. ...where's the option to add things to my existing wishlists? How can I edit cart quantities without totally removing and re-adding items? Favorites list is a good idea, but how does it tie into the online site so I can view/shop from my favorites there as well? Or is the favorites in place of wishlists since wishlists weren't added to the app? Saved shopping carts where? All in all I like the app. Yeah, I'm being picky about the wishlists, but only because I use them so much. 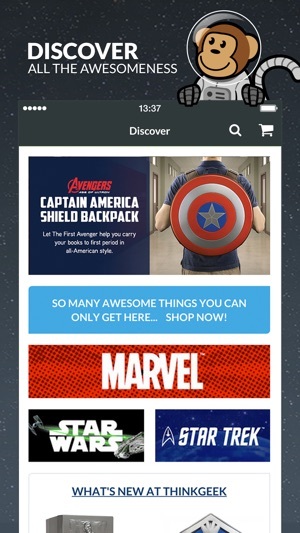 It's super easy to navigate the app and shop, no glitches adding discount codes or items, easy to sort accurately by price or whatever without things vanishing or being out of order (I'm looking at you Disney and Target), and of course excellent selection of merch! Only wish in general is some indicator (in app and on site) when an item is clearance or low stock. Otherwise A+ for style and accuracy in use and C+ for feature crossover from the site. Where tf do I even start? First of all it constantly logs me out. I finally found the chance to buy something and when I did I accidentally put the wrong address. So I was going to change it and it turned into me having to make an entire UPS account only to find out that I have to pay 5 more bucks to change the address. I also payed 12$ to have it delivered within 5 days. It’s now Wednesday and I’m now figuring this all out. ThinkGeek is horrible at notifying you of anything, and you can’t even fix your shipping problems from there. Not to mention I still can’t make a request at UPS because the site and app is glitching and won’t allow me to go through with the request. I’m getting my money back for the expedite option and never EVER USE THIS HORRIBLE APP EVER AGAIN. 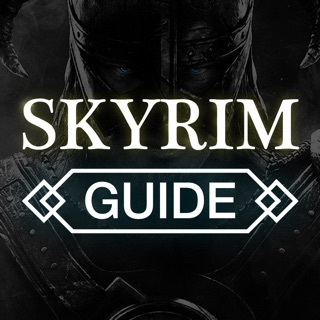 This app seems more like a webpage that is for a desktop or laptop. Not even a webpage designed for mobile use. I’m not even sure why there is an app as the company is clearly not ready for customers using it. They could likely use the help of the company’s target audience in creating a usable app. I tried to do Xmas shopping on the go. Just checked the status of what I ordered nearly a week ago and see the order of ‘cancelled.’ Tried to use the ‘live chat’ feature and it’s not a working link. No idea why this was canceled. I did not receive an email. And now I likely will not receive my gifts in time. Bummer.